Model 12C Product Folder - Cryogenic Control Systems, Inc.
Two independent multipurpose input channels support Diode, Platinum RTD and most cryogenic NTC temperature sensors. Operation from 500mK to over 1,200K with an appropriate sensor. Remote interfaces include Ethernet and RS-232. IEEE-488.2 (GPIB) is optional. LabView™ drivers available for all interfaces. IEEE-488.2 SCPI compliant, ensuring your system software will not become obsolete. Note: The Model 18C and 14C have been replaced by the Model 18i and 14i. Input Connectors: One DB9 receptacle provides 4-wire measurement connection plus shield for both input channels. Ethernet: RJ-45 with Power over Ethernet and LAN activity indicator LEDs. Power jack, 7.5 to 48V AC/DC external power. Relay #1 and #2 connection, detachable terminal block. Sensor Inputs : The Model 12C has two input channels. Each input is independent and is capable of supporting the same wide range of sensor types. Inputs are not scanned or multiplexed. Silicon diode sensors are supported over their full temperature range by using 10uA constant-current DC excitation. Robust support for Negative-Temperature-Coefficient (NTC) resistor sensors by is given by using constant-voltage AC excitation. Example sensors include Ruthenium-oxide, Carbon-Glass, Cernox™, Carbon-Ceramic, Germanium and several others. Positive Temperature Coefficient (PTC) resistor sensors including Platinum, CLTS and Rhodium-Iron RTDs use constant-current, AC or DC excitation. The Model 12C includes built-in sensor calibration curves that support most industry standard temperature sensors. Additionally, eight user calibration curves are available for custom or calibrated sensors. Each user curve may have up to 200 entries. Easy to use: The monitor's front panel consists of a large, bright TFT-LCD display, a 4-key keypad, an audio alarm and three status LEDs. Several display formats may be selected. Both temperature readings may be displayed simultaneously with alarm and relay conditions, or two channels with input names and temperature shown in a large easy to read font. Additional screens include temperature readings along with relay and alarm status information. A single key press takes the screen to a menu tree where most features and functions of the instrument can be configured. Input Power : The monitor may be powered by any source providing 7.5 to 48 Volts AC or DC. The IEEE 802.3af Power over Ethernet (PoE) specification is also supported, allowing the Model 12C to be powered by it's local area network connection. Alarms and Relays:Two 10A dry-contact relay outputs can be asserted based on temperature setpoints from user selected input channels. Data logging: Temperature data may be continuously logged into a large internal buffer. Data is time-stamped and saved in non-volatile memory. Remote Control: Standard Remote Interfaces include Ethernet and RS-232. Remote interface commande language is IEEE-488.2 SCPI compliant. A full IEEE-488.2 GPIB interface is available as a compact external option that connects to the Ethernet LAN port. Remote interfaces implement an IEEE-488.2 SCPI compliant remote command language that is easy to learn and easy to read. This language is identical across all Cryo-con products to ensure that your investment in system software is always protected. LabView™ drivers are available for all remote interfaces. 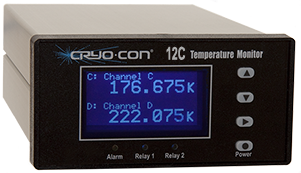 Cryogen-Free magnet systems require many sensor inputs. Remote command language is SCPI compliant.